Sushi Shop, the European chain known for high-end lunchtime dine-in and take-away sushi is expanding its London presence. 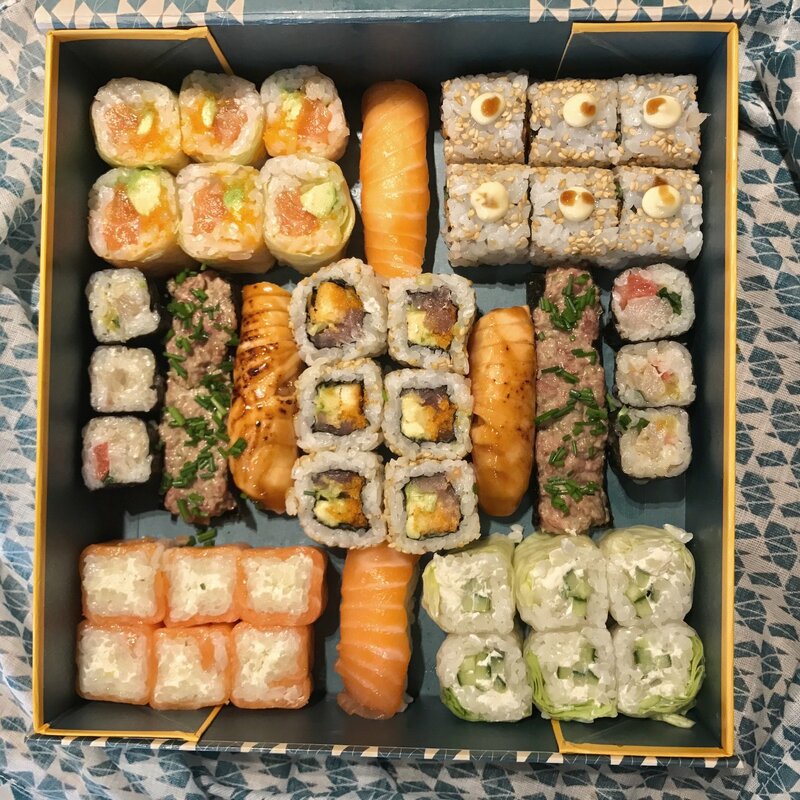 For those who haven’t already savoured sushi in the Marylebone, Old Brompton Road or Notting Hill branches, Sushi Shop is expanding to Hampstead and Richmond. Whilst the autumnal weather may have cooled from the summer heat of only a few weeks ago, visit Hampstead Heath not now for a dip in the pond, rather for sushi as an excuse to indulge in Japanese and Californian-inspired sushi, sashimi, poke, tartare and more. Those who class themselves as ‘citizens of the world’ may recognise Sushi Shop from across France, the Netherlands and UAE. Sushi Shop regularly collaborates with creatives (such as Kenzo, Kate Moss, Scott Campbell), and this season is no different. October sees a stunning Sushi Shop limited edition collaboration with French Interior Design company Maison Sarah Lavoine, which we at Vada think might just be the prettiest sushi packaging of all time. We popped into the Marylebone branch, to find a pre-ordered limited edition box (£39.90) freshly prepared for us exactly on time. Beef Tartar Sushi – rice, topped with tartar of beef, gherkins, capers, red onions, chives and a touch of heat from mustard and Worcester sauce. This not-illogical progression in sushi was enjoyable albeit rather large to handle. Citrus & Basil Sea Bream Maki – yellow-tail tuna rolled with a tang of grapefruit and orange with lime and basil. For those looking to experience new and quirky sushi creations, we recommend this for a fresh and fruity appetite pleaser. Crusty Tuna California – tuna and spicy sauce, with crunchy croutons and massage fish eggs. The Cucumber & Cheese Spring (with a dash of wasabi) and the Spicy Salmon Spring also impressed. 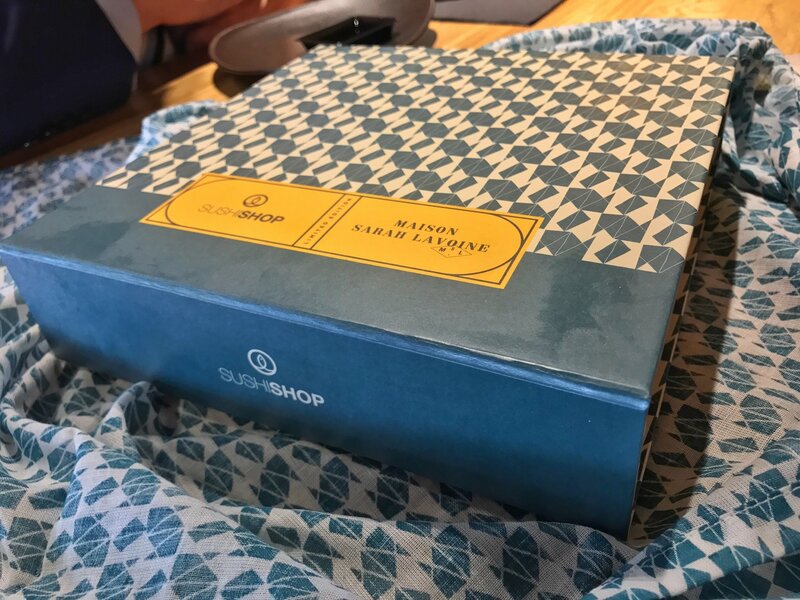 For a lunch, the price for the limited edition box is not for a regular occurrence; however as a lunch to impress the Maison Sarah Lavoine box from Sushi Shop will do just that. Smaller lunch boxes from £9.90 and sushi pieces ordered individually are also available. With an increasing number of venues across London we at Vada look forward to greater accessibility to this premium sushi brand. 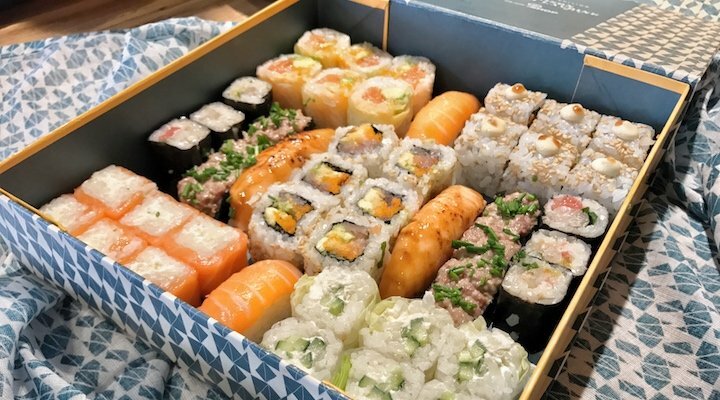 For more information and to check if Sushi Shop deliver locally to you, visit mysushishop.co.uk.